Get your driving life off to a great money-saving start with eco-driving. As petrol prices reach a record high, it's becoming even more important to learn Eco-driving techniques. Why should I learn Eco Driving? By changing the we drive and learning simple techniques, we can save money on our fuel costs. According to a DVSA trial the average motorist covering 12,000 miles a year can save up to £232 a year and one who drives 36,000 miles can save up to £700 a year. Eco driving is a smart way of saving money on those spiralling petrol costs. 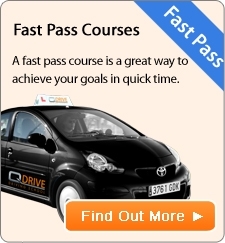 Why does QDrive encourage this way of driving? Eco driving techniques are included FREE in our learner driving lessons and refresher lessons - ask your QDrive instructor for more information and tips. Whilst driving around town, turn the air con off and open the windows but when driving at high speeds use the air con.